It is easy to embed YouTube videos in your website. 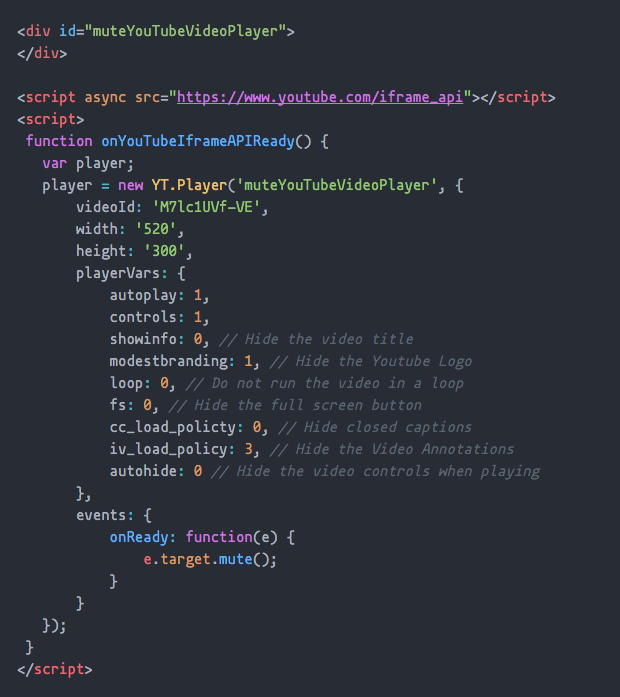 You just have to copy the IFRAME embed code and paste it anywhere on your web page. YouTube does offer basic customization options – like you can modify the player dimensions or hide the YouTube branding – but if you would like to have more control over the layout or behavior of the embedded player, YouTube Player API is the way to go. This tutorial explains how you can embed a YouTube video that will automatically play when the web page is loaded but with muted audio. For instance, a products website may use short screencasts to highlight features and these videos will autoplay when the page is loaded. The volume is however set to 0 and the user can manually click to unmute the video. Similarly, if you are using YouTube video backgrounds, it makes more sense to embed muted videos that run in a loop. See the demo page to get an idea of what we are trying to do here. The page loads, the video plays but with the audio slide is all the way down. This is easy. Go the YouTube video page and note down the ID of the video from the URL. For instance, if the YouTube video link is http://youtube.com/watch?v=xyz-123, the video id is xyz-123. 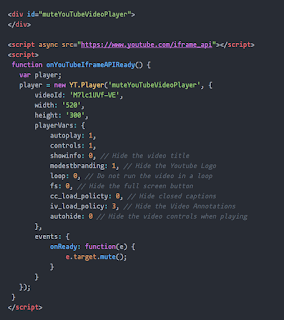 Once you have the ID, all you have to do is replace YOUR_VIDEO_ID in the following code with that string. Next place the edited code on your web page and the embedded video would automatically play but the sound is muted. You can further customize the player by modifying the various player variables as commented in the code. For instance, if you set loop as 1, the video will play in a loop. Set fs to 1 to show the fullscreen button inside the video player. Internally, the player is embedded using the YouTube IFRAME API. When the page is loaded, the onReady event runs that mutes the video.